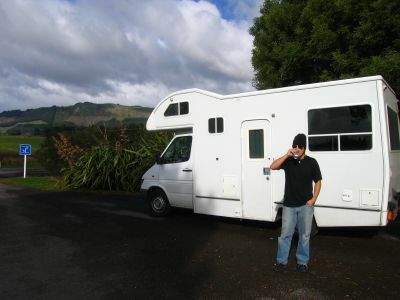 each night, we pulled our campervan into a roadside rest stop and parked for the night. we had tunes rocking on the stereo, cold beer in the fridge, and lively conversations within. the girls would cook dinner, paul and i would play guitar and sing and then do the dishes. awesome. it had a toilet, a shower, a stove, a microwave, a sink, and four beds. 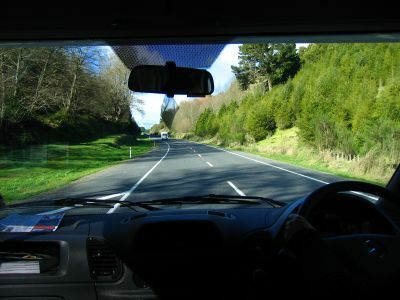 a rolling home, the only way to see new zealand. 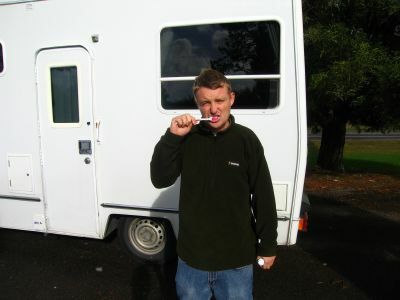 paul brushing his teeth outside the van. our next stop on the north island was rotorua. 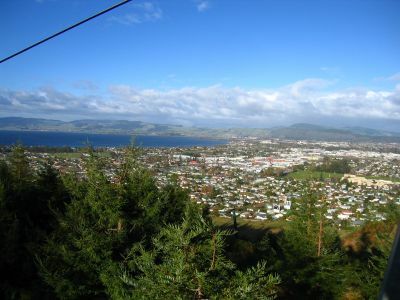 while we were riding the chairlift up the mountain to go luging i took this shot of rotorua. 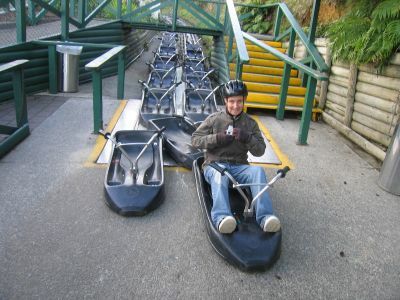 luging: flying down the mountain on a twisting, dipping, slippery concrete track in a powerless cart that you can barely control. 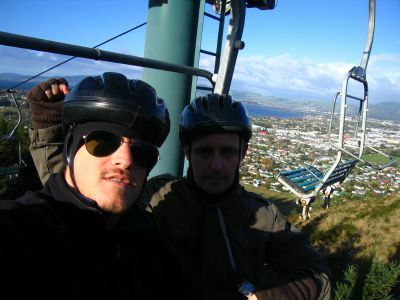 one of the many crazy sports kiwis have invented in an attempt to kill as many tourists as possible. paul and i definitely needed the helmets because we were only concerned with one thing on our luges: beating each other to the finish line. 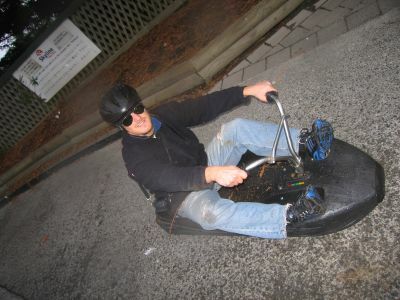 at the top of the hill, paul picks out what he believes is a winning machine. i ended up losing 3 out of 4 races but it was not because of a lack of effort - i flew off the track about 6 times, twice getting chucked completely out of my vehicle. i am covered in dirt and tree branches in this picture that paul shot at the finish line. 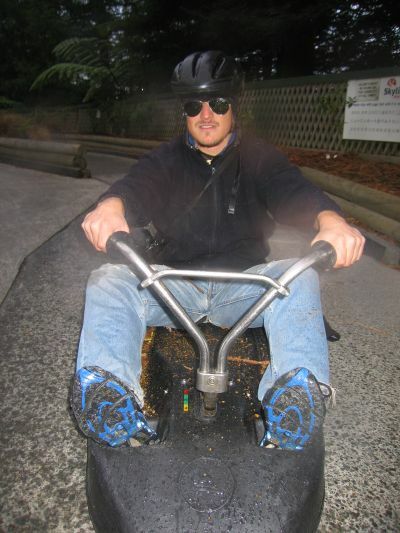 in his emails to me now, paul refers to himself as the Luge King of Rotorua. i want a rematch. i lost but it was one of the most fun things i have ever done. the videos i took while flying down the track are amazing. 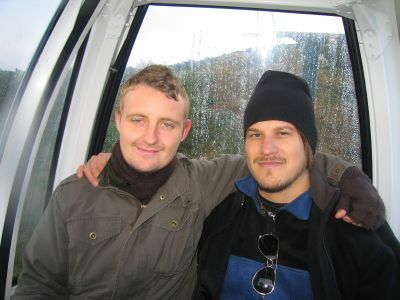 paul and i riding the gondola down. we finished up just as it started pouring. it's was so cool to just chill out at the table in the back of the campervan while the tunes blared and the incredible scenery rolled by outside the window. one of the best things i've done in 15 months. 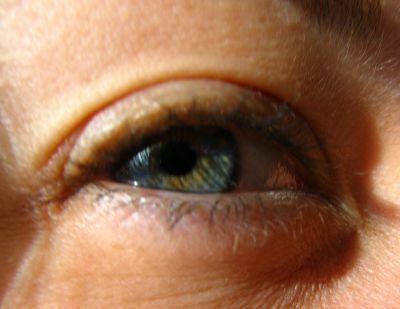 i felt so good i took a picture of sharon's eye.